It wasn’t long ago when digital signage was being sold as a way to reduce printing costs, and to update information in a timely manner. Digital panels were essentially very expensive posters. Recent innovations in display and software technologies have transformed the use of digital signage as a medium. For retail marketers, creating visual experiences to engage customers is not new. But when brilliant creative teams are armed with new digital signage display technologies, and customized digital tools—magic happens. When tiled together to create a video wall, the Planar 55-inch Clarity Matrix MX55HDX with extreme narrow bezel provides a tiled bezel width of just 1.6 millimeters or less than one-sixteenth of an inch, creating a cohesive, high-impact viewing experience. Some of the world’s largest marketing agencies are creating new departments for an opportunity to shape and touch more of the customer buyer’s journey. One such agency is DCI-Artform, a Marmon/Berkshire Hathaway Company whose clients are among the Fortune 100 global companies. Digital signage is among one of the mediums used to develop and deliver retail marketing solutions and environments that engage, inform, and convert consumers into buyers. Custom controllers, sensors, and less traditional media models are where bigger ideas can flourish, Alpert noted. “Transparent interactive screens are one of my favorite things happening in our space right now.” With the cost becoming more reasonable, Alpert is looking at this as a solution for augmented reality (AR), because the viewer does not need to do anything. “There has been such an incredible opportunity to craft stories with AR, but adoption on platforms and using mobile has been difficult,” Alpert said. Transparent, interactive screens opens-up that style of storytelling. Planar Systems, a Leyard Company, recently introduced its Planar LookThru OLED transparent display. “Transparent Organic Light Emitting Diode (OLED) technology overcomes one of the major hurdles to transparent LCD display adoption by making it possible to create truly see-through installations unobstructed by enclosures that sit behind the displays,” said Jennifer Davis, vice president of marketing and product strategy at Planar Systems and chief marketing officer at Leyard. Experiential digital signage is infinitely more measureable than static or even digital signage of the past, because interactions themselves can be counted and provide valuable data, Davis pointed out. “These data sources can provide valuable insight into brands about how often their interactive digital signage is engaged, and how it ties into other initiatives like mobile and social marketing,” Davis said. “They can now track user sessions, duration of engagement, number of clicks or shares, and they can ‘heat map’ the application to provide insight into the most popular (or least popular) features of the experience, and to provide opportunities for improvements to the user interface.” This aligns with what retailers, advertising networks, and others expect regarding measuring ROI. Richard Daugherty, digital media solutions engineer, at design and integration firm AVI-SPL, added, “Digital signage provides a platform for customers or viewers to give feedback; their product reviews or answers to surveys can be displayed on your screens.” This validates to the customer that they’re being heard. Whether in the form of a flat panel, a projector, a multi-touch panel, transparent, or curved display; the world of digital signage has been transformed. LG is certainly doing its part to offer new technologies and form-factors. 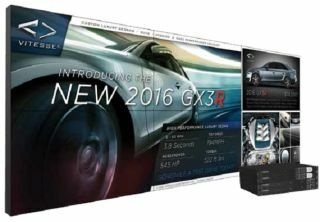 LG recently announced its 86-inch Ultra Stretch digital signage solution (86BH5C) which moves away from the standard 16:9 format to a whopping 58:9 format providing a 7-foot long, “stretched” display. By the end of 2016 we are sure to see more new digital signage technology and display announcements from various companies. Commercial applications often follow consumer adoption; and for more than a year some consumers in Japan have be watching 8K TV in their homes. We already hear the buzz.